Everybody has questions about life and its meaning, but many times we struggle to put those questions into words. 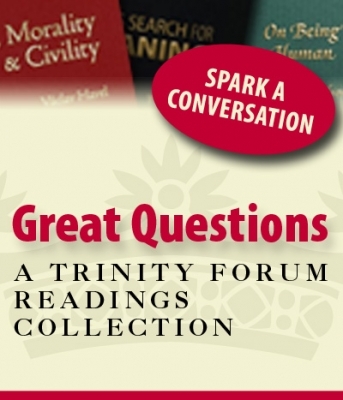 The five booklets in this Readings Collection can help introduce your colleagues or family members to the deepest questions of all time, and equip them to engage those ideas more thoughtfully. Lessons from History | Summarizes Durants’ popular multi-volume history, The Story of Civilization; includes selected portions from each chapter followed by comments drawn from Trinity Forum Co-Founder Al McDonald’s life experience in business, politics, journalism, and academia. Man’s Search for Meaning | After surviving the Nazi concentration camps, Frankl concluded that the search for meaning in life is the prime motivational force for human beings—and an absolute essential for their mental health. On Being Human | Written for the Atlantic Monthly in 1897 before Wilson became president and presents his vision of the good life, which is both hopeful and historical, drawing upon both Aristotle’s notion of “the golden mean” and Augustine’s view of the ordo amorum (the order of the loves). Why Work? | Sayers’ Christian understanding of work, critiquing the dichotomy of “sacred’ versus “secular” work and raising concerns about unsustainable consumption.